Create enticing meals in minutes with the Cosori Personal Electric Pressure Cooker. This appliance traps steam inside while building pressure to increase cooking temperatures, allowing food to cook twice as fast as conventional cooking methods. The result of this process is healthy and delicious meals that hold up to 90-95% of nutrients. From one-pot chicken dinners to savory soups, stews, and even sweet desserts, this little giant from Cosori can do it all. This all-in-one kitchen appliance comes with 12 cooking programs to choose from, allowing you to steam, stew, sauté, and even bake your favorite meals. An intuitive control panel makes it simple to program the pressure cooker’s settings along with an easy-to-read LED and display built-in timer. The included rice spoon, ladle, steamer rack, measuring cup, and glass lid can help you start pressure cooking right out of the box. The personal-sized 2.1-quart pot makes this unique pressure cooker perfect for those who are constantly on-the-go. Imagine coming home to savory stews or sweet desserts packed with the necessary vitamins and nutrients to keep up with a busy lifestyle. It is the ideal kitchen appliance for college students, working professionals, and small families who are looking for a more efficient way to better cook their meals. With the Cosori Personal Electric Pressure Cooker, cooking in the kitchen has never been easier and healthier. Want to cook without leftovers? 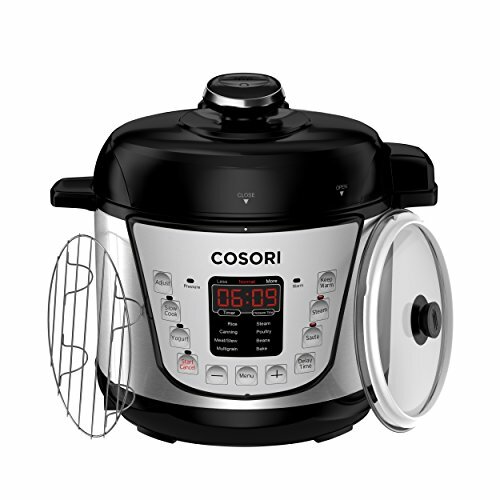 The Cosori Mini 2qt pressure cooker is perfect for you! A good kitchen companion for 1-2 persons, like newlyweds, students and small families to make dishes or side dishes. Small to easily storage and take, whether you are a business trip or travelling by RV, a healthy and delicious meal is so easy and quick to prepare. Small does not mean less. Replaces 7 traditional kitchen devices- Pressure Cooker, Slow Cooker, Rice Cooker, Sauté Pan, Yogurt Maker, Steamer & Warmer; make meals without the stress to find cookware everywhere, and the tiredness to clean multiple pots and pans; also could cook egg. No idea how to cook? Features 13 Micro Processor-Controlled programs: Rice, Yogurt, Soup, Multigrain, Slow Cook, Bake, Steam, Sauté, Poultry, Beans, Meat/Stew, Porridge, Keep Warm, just put in all the ingredients, even a child could be a chef by simply pressing a button. Up to 24 hours delay time and keep food warm up to 24 hours, wake up with the food smell to begin your energetic day in the morning or enjoy a nutritious and healthy meal after long time work. Tired of Cleaning? All the accessories are dishwasher safe, including a glass lid for slow cooking, steamer rack, rice spoon, ladle, measuring cup, extra silicone sealing ring and Recipe book; food-grade stainless steel (18/8) inner pot with 3-ply stainless steel & aluminum base for strong thermal conductivity. Safe is the priority. ETL, CETL, FCC & FDA-approved; 9 safety mechanisms ensure safe operation for daily use by beginners or professionals.